Harry Potter and the Forbidden Journey is the signature attraction in the Hogsmeade component of The Wizarding World of Harry Potter, in Universal Orlando’s Islands of Adventure. It has attracted many gushing reviews and at least one unrealistic and cranky one. The truth, for most, will be somewhere in between. Harry Potter and the Forbidden Journey deploys state-of-the-art theme park technology to create a stunning queue, and a mostly marvelous attraction. However, in some ways the technology isn’t supported as well as it could be. In other ways, the designers got a little too excited by the technology itself. The upshot is that for most people the ride is a “don’t miss” if you are at Universal Orlando anyway. However, for first time visitors to Walt Disney World, I would not take a morning out of a Disney visit to see the Forbidden Journey of Harry Potter unless your kids just won’t give you any peace otherwise. 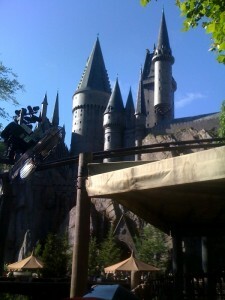 Many reviewers have called Harry Potter and the Forbidden Journey a combination of Epcot’s Soarin and The Haunted Mansion. I get the comparison–the ride has projections of images like Soarin, and physical environments with scary figures that recall, in a much scarier way, the Haunted Mansion. But the better comparator at Walt Disney World is the Animal Kingdom’s Dinosaur. 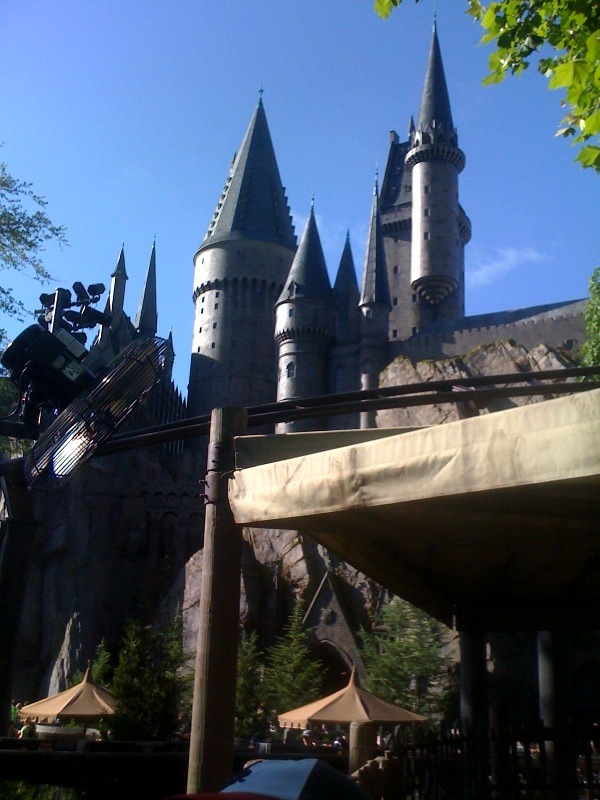 Like Dinosaur, the ride is powered by a motion simulator–in the case of Forbidden Journey, a quite advanced one. Like Dinosaur, cool and surprising audio-animatronics emerge, sometimes when you least suspect it. Like Dinosaur, the overall story of the ride is very thin, and simply an excuse for a sequence of vignettes that don’t tie to or build on each other. Like Dinosaur, the ride vehicle is so much so the real star of the ride that it calls too much attention to itself. And like Dinosaur, if you are at all subject to motion sickness, the ride will be one of seemingly unending misery. The experience begins with the queue itself. Once you get in to the Wizarding World of Harry Potter, and into Hogwarts Castle, dump your stuff into the lockers on the right. 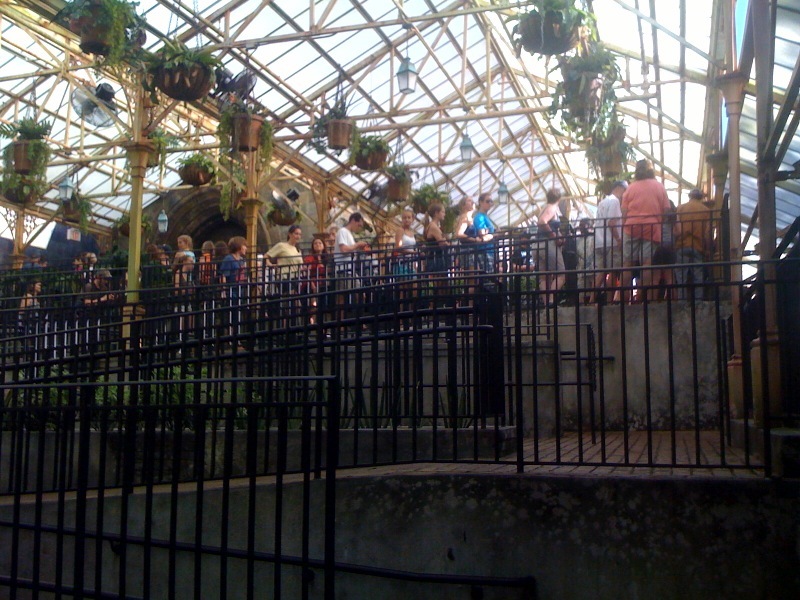 You then enter the queue, first outdoors, and then in a greenhouse that is not quite as steamy, even in June, as one might fear. Then you go back inside the castle, and the magic begins. I’m not gonna give away any spoilers, but the quality of the experience of the waiting line for Harry Potter and the Forbidden Journey is far, far better than anything else in the theme park universe. This queue itself is almost the price of entering Universal Orlando. The ride–and again, I’m not gonna give away details, because as in all such things, the mystery of what happens next is a big part of the fun–begins with projected images, then moves into physical spaces, and varies back and forth between the two environments. The problem is that the projected images are not well done, and the physical environments seem poorly paced. I’m not sure what the issue is with the projected images–too slow a data rate? Not enough time spent on animation? Regardless, my first thought, on seeing the first image, was “that’s really blurry and thin on detail.” This is the case with later projected images as well. Not a great first impression. The physical environments are much easier to look at, and sometimes quite fun. However, the pacing through the physical environments is not well matched to the pacing of the images (you move too quickly in the projected areas, and it seems that you move too slowly in the physical environments), so the reaction becomes not one of marveling at what is present, but rather wondering what’s next. Meanwhile, your ride vehicle is zooming around, sometimes in accord with the action, but often quite purposelessly. For those with cast-iron stomachs, the zooming is fun, although at times a pointless distraction from the rest of the ride. For those with moderate or higher degrees of motion sickness, the zooming will get old very fast, and re-present itself as severe discomfort. To compare the potential for motion sickness with Walt Disney World, I’d put it between Dinosaur and the orange side of Mission: Space. If you can take the orange side of Mission Space, the Forbidden Journey of Harry Potter will pose no problems at all. If Dinosaur feels like the outer edge of your capability, seriously consider avoiding the Forbidden Journey. 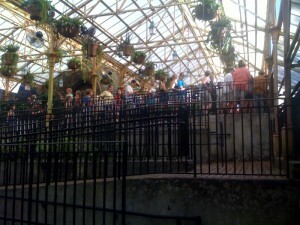 If Star Tours or the Tower of Terror is too much for your motion sickness, then absolutely avoid the Forbidden Journey. 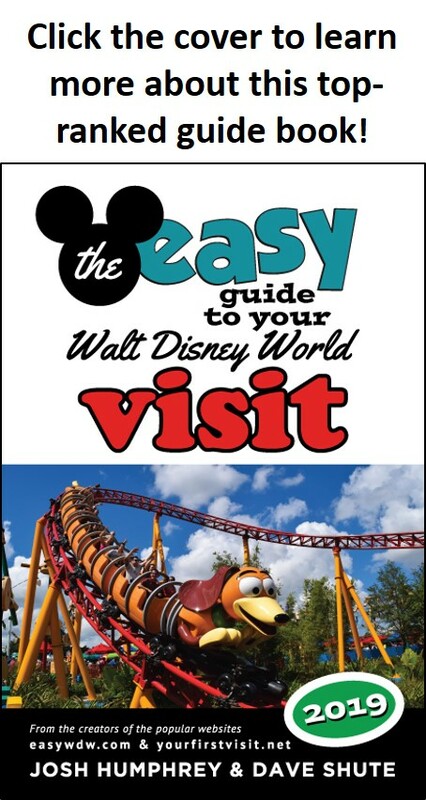 Note that even if motion sickness is an issue for you, the queue is still very much worth seeing–go through the queue, and then bail before boarding the ride itself. 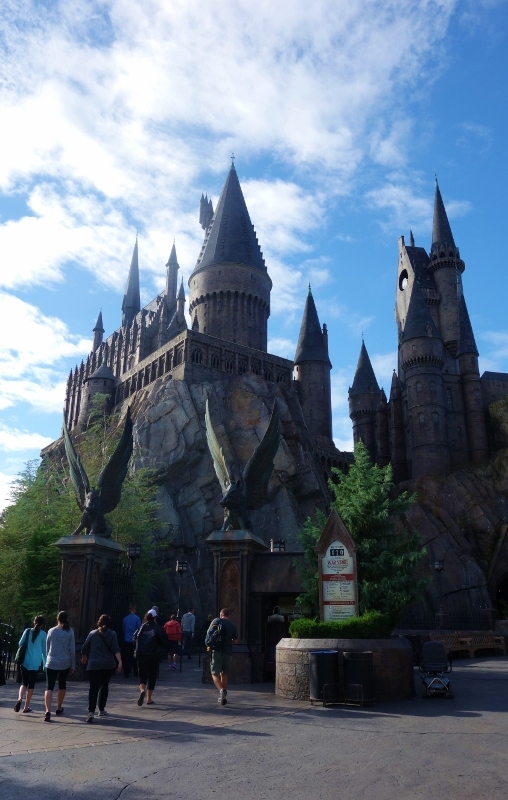 Universal Orlando is a place for thrill rides, and the technology deployed at Harry Potter and the Forbidden Journey creates the opportunity for a very cool, very thrilling simulation of wizarding flight. That said, flight simulators are famous for making people upchuck. In my view, the designers have dialed up the zoom too intensely–perhaps because the quality of the projected images is so poor, and the physical environments too slowly-paced?–and, as a result, have left too many of their audience on the runway. I went to the link you posted about the cranky, unrealistic review and laughed aloud when it turned out to be a Slate article. I’ve long disliked the material from Slate and those who write it – and the reason is because, it doesn’t matter WHAT they write about, it’s always negative. I completely disregard anything that publication has to say. First time I went to the ride but my 3 year old started to yell at the top of her lungs minutes, I repeat “minutes”, before jumping on the ride so my wife had to take her straight to the restroom (something inconvenient for other guests waiting in line let me tell you). I had a bitter sweet aftertaste and said to myself “you’re no fan of HP, it ain’t worth the wait again”. Second time my wife went with my eldest child and I stayed with the little girl asleep on her stroller. Hi Dave, I’m wondering if I could handle Harry Potter and the Forbidden Journey. The ending of Test Track was too much for me (not motion sickness wise, just…..neck / back wise….). I did fine with a mostly virtual reality ride at Busch Gardens Williamsburg–the things we were sitting in didn’t move so much, so you could close your eyes if you needed to escape. Is Forbidden Journey like that, or do you get thrown around a lot? Thank you for any advice! Jane, you do get thrown around a lot. I just remembered that Busch Gardens ride was called the Curse of Darkcastle. Thanks Dave. I will have to skip it, but as per your advice I would go through the queue once to see that, then exit before the ride.